If there’s anyone who knows the spirit of celebration….it’s a football fan! It’s clear true football fans are totally in the moment as they rocket out of their chairs repeatedly….cheering, jeering, and beering in my experience, haha. If you’ve witnessed this football fan phenomenon, then you know that the love of the game doesn’t totally end after the moment either. Which is one reason that this crochet football baby pattern has been such a huge hit with my followers for a while now. 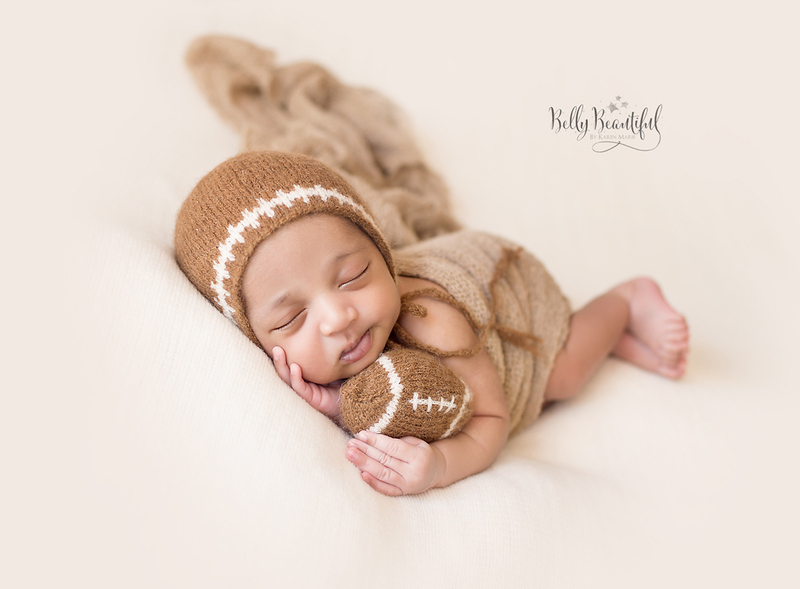 Football lovers find this set SUPER cute….which makes it an awesome touch-down (hehehe….pardon my inclination to always make cheesy jokes) of a baby gift. This free knit football pattern features both a bonnet and a football stuffie and features sport weight yarn and size 3.75mm (US5) knitting needles. Pick up white yarn and alternate between the two colors, carrying the un-used yarn behind your work. Drop brown yarn. Do not cut. Pick up brown yarn and alternate between the two colors, carrying the un-used yarn behind your work. Drop and cut white yarn. Repeat Rows 9&10 until your piece measures approx. 4.5” (11.5cm) from the cast on edge. End on a repeat of row 9. Move sts to Double Pointed Needles or use the Magic Loop Method. Do not bind off. Cut approx. 7 inch tail. Using yarn needle, remove all sts from DPNs or magic loop, as if to purl. Pull tail through sts to cinch the back of bonnet. Using yarn needle, pull tail through to the inside of the bonnet. Tie a knot and weave in ends. Cut two strands of yarn approx. 38 inches long and pull them in a loop through a front corner of your project. Pull the ends of the yarn through this loop (this attaches the yarn without any knots, and makes your project look smoother). Separate the yarn into three sections and braid them to desired length. Secure and cut yarn evenly on the ends. Repeat on the other side of the bonnet as well. Repeat Rows 9&10 until your piece measures approx. 5” (12.75cm) from the cast on edge. Repeat Rows 9&10 until your piece measures approx. 5.25” (13.5cm) from the cast on edge. Repeat Rows 9&10 until your piece measures approx. 5.75” (14.5cm) from the cast on edge. Repeat Rows 9&10 until your piece measures approx. 6.25” (15.75cm) from the cast on edge. Cast on 6 sts onto Double Pointed Needles using brown yarn. Drop and cut Accent Color 2 Yarn. Pick up Base Color 1 Yarn. Repeat Round 13 until your project measures approx. 3 inches (7.5cm) in length from the starting point. Stop at this point to secure any ends and stuff your football. You may need to also add some stuffing during the next few rows of decreases. Do not bind off. Cut approx. 7 inch tail. Using yarn needle, remove all sts from DPNs or magic loop, as if to purl. Pull tail through sts to cinch the top of football. Using yarn needle, pull tail through to the inside of the football. Secure and weave in ends. Use your yarn needle and your white yarn to embroider some lacing onto the center of the football.